Elementary Matters: What Phrases Do You Repeat Over and Over? 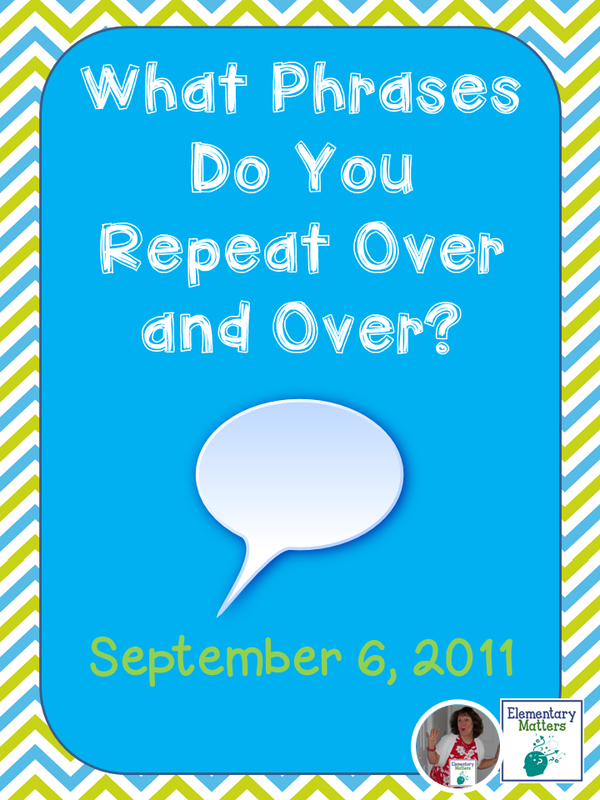 What Phrases Do You Repeat Over and Over? Here's another one of my earliest blog posts! I'm sure you have phrases you repeat over and over in the classroom. As I look at this list, I realize many of them came straight from my dad. Who ever thought that teaching second grade would be so similar to coaching high school football? Here are some of my most famous quotes in the classroom! There are some phrases that I say over and over. It gets to the point where the kids say these phrases along with me. "When I'm done talking not before..."
"Turn and talk to your partner"
"We don't save places in line." "I can and I will!" "It's good to see you today." "Your desk should look like ____'s." "A wrong answer is better than no answer, because wrong answer means you tried." "Don't make me put on my grumpypants!" "A mistake helps you learn. That's how I got so smart." "Thanks for making that mistake. You helped us all learn." "Thanks for bringing that to our attention." "You have the power to change that!" "Exercise is good for the brain." "Check behind your behind to make sure you didn't leave anything behind!" "It helps the brain remember if you...."
"As long as you do your best to learn, I'll do my best to make it fun." I could go on and on, but I won't. What phrases do you repeat a lot?